The calendar insists it’s September 4, but I’d swear it’s June 4, staring out my rain-splattered window. Sheets of wind-driven water, pond-size puddles, a sluggish front draped overhead? September is having a serious identity crisis. Today will be the wettest day of the week, with waves of rain surging across the southeastern third of Minnesota. Some 1-3 inch totals are possible in the metro, with up to 5 inches of rain (roughly 6-7 weeks worth of moisture) drenching southeastern Minnesota before skies finally dry out on Wednesday. And yes, this is a bit odd for early September. 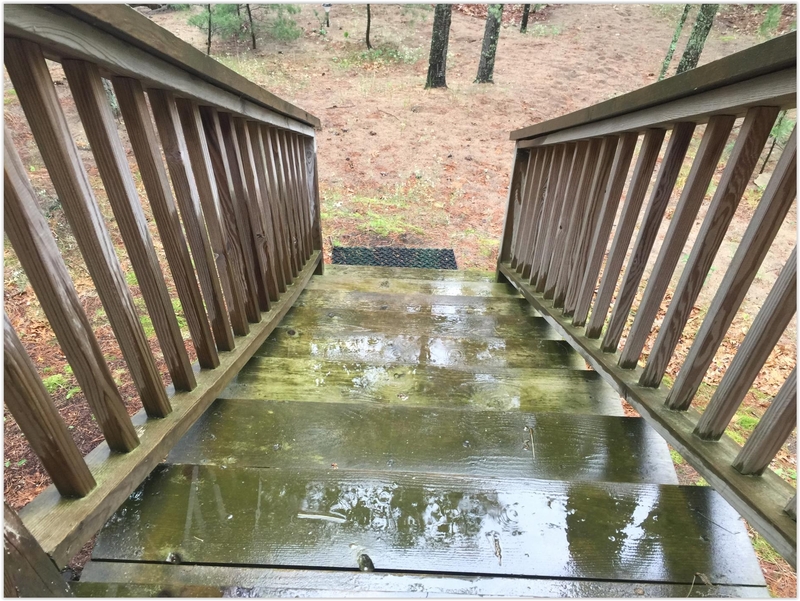 Although the heaviest rains remain just south of Minnesota the latter half of the week, a few showers may brush southern counties, with daytime highs in the 70s. Enjoy the cooling trend, because ECMWF models predict more 80s returning next week. Perpetual summer. Meanwhile Tropical Storm Gordon is churning toward Mobile and New Orleans, and models hint at Hurricane Florence impacting the Carolinas the middle of next week. Note to self: try not to complain about soggy shoes and road construction. Ahead of the front, a 30 to 40 knot low level southwest flow transports 2.00+ inch precipitable water air (which is between two and three standard deviations above the mean) across IA into southeast MN and central WI. Rainfall Predictions. Models are all over the map, with anywhere from .4″ to over 2″ for MSP. Odds favor 1-2″ for the Twin Cities, with considerably more possible south/east of the metro area. 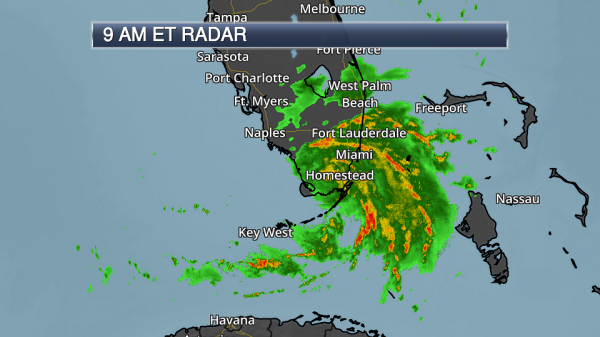 Tropical Storm Gordon formed this morning over the upper Florida Keys with sustained winds of 45 mph. Gordon is expected to move over the southern tip of Florida today before moving into the Gulf of Mexico. Gordon will continue to track to the northwest/west-northwest over the next several days. On this track, Gordon will approach the central Gulf Coast by Tuesday night as a tropical storm with at least 60 mph winds. 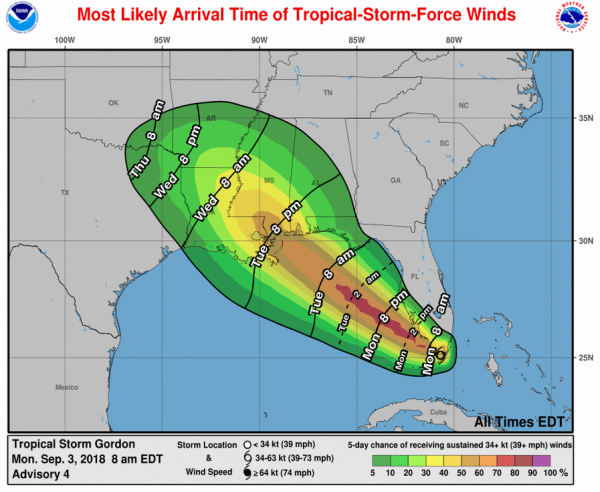 Gordon will bring gusty winds and heavy rain to parts of southern Florida and the central Gulf Coast over the next several days. Parts of the central Gulf Coast could receive 5-10” of rain through the end of the week. Tropical Storm Warnings as well as Flood/Flash Flood Watches have been issued for southern Florida and parts of the central Gulf Coast, including Miami, Mobile and New Orleans. Storm Surge Watches are in effect from the Mississippi-Alabama border to the mouth of the Mississippi River. 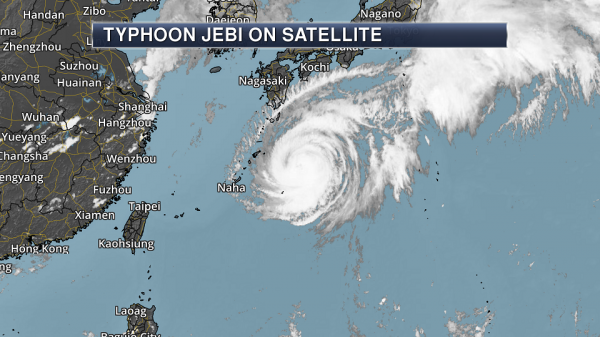 We’re also tracking Typhoon Jebi, which will make landfall Tuesday local time across southern Japan (far southwest of Tokyo) with damaging winds and heavy rain. Heavy rain will also continue through at least the middle of the week across parts of the upper Midwest. 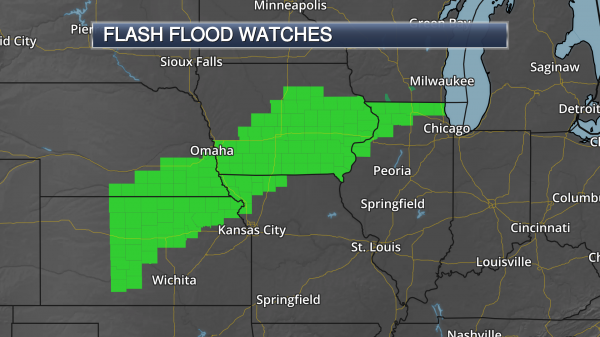 Rainfall total of 2-4”+ will be possible, and Flash Flood Watches are in effect from Kansas to Illinois. 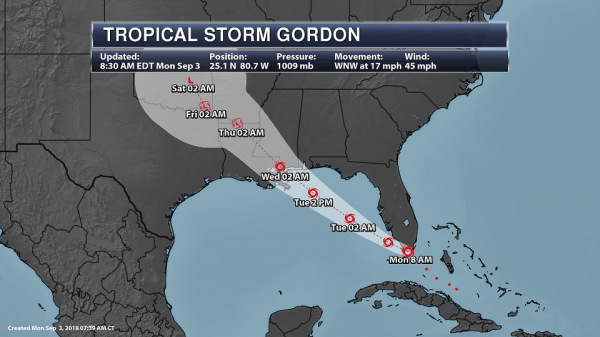 Tropical Storm Gordon. Potential Tropical Cyclone Seven formed yesterday evening between Cuba and the Bahamas, however as of an 8:05 AM special update from the National Hurricane Center this system was upgraded to Tropical Storm Gordon based off of surface observations and radar data. Gordon is bringing rain to parts of southern Florida this morning, with over 2″ falling at Homestead AFB over the past 12 hours. As of a special advisory issued at 8:30 AM, Gordon had sustained winds of 45 mph. The center of Gordon was about 20 miles west of Key Largo or 85 miles southeast of Marco Island and moving to the west-northwest at 17 mph. Path Of Gordon. Gordon will continue to move away from Florida through the day into the overnight hours, continuing to the northwest/west-northwest over the next several days. By tomorrow morning, Gordon is expected to have sustained winds of 60 mph and at least hold at that strength through landfall sometime Tuesday Night/early Wednesday morning in southeastern Louisiana or southern Mississippi. There is some uncertainty in the intensity forecast, and adjustments are likely over the next several days. Gordon will weaken once it moves inland, becoming a post-tropical system by Saturday morning across parts of Oklahoma. This system will continue to produce gusty winds and heavy rain after landfall across parts of the lower Mississippi Valley and southern Plains. Tropical Storm Warnings. Due to Gordon, Tropical Storm Warnings are now in effect across southern Florida for the potential of wind gusts up to 45 mph. This Tropical Storm Warning includes Miami. Meanwhile, along the central Gulf Coast, Tropical Storm Warnings have been issued across parts of southeastern Louisiana, southern Alabama, and southern Mississippi ahead of Gordon. This includes the cities of New Orleans, Baton Rouge, Biloxi, Gulfport, and Mobile. The best potential of tropical storm force winds will be Tuesday evening into Wednesday across the region. * Alabama-Florida border westward to east of Morgan City, Louisiana, including Lake Pontchartrain and Lake Maurepas. Tropical Storm Force Wind Arrival Time. Tropical storm force winds will continue to be possible across parts of southern Florida throughout the day before Gordon finally pushes away. As the system continues northwest, tropical storm winds will continue to spread toward the northern Gulf Coast, impacting areas like the western panhandle of Florida into southern Alabama Tuesday, then into the New Orleans and Baton Rouge areas Tuesday night. Flood Watches are in effect across southern Florida through this evening for the potential of 2-4″ of rain. Flash Flood Watches are in effect across eastern Louisiana, southern Alabama, southern Mississippi, and far western Florida from Tuesday through Wednesday due to the potential of heavy rain from Gordon. Rainfall totals of 2-6” are expected, with isolated higher amounts possible. Flash Flood Watches across southeast Texas and southwest Louisiana are not connected to Gordon. They are in effect through the evening hours today for the potential of 3-10” of rain. This watch does include Houston. We are also watching the potential of storm surge flooding with Gordon as well, and Storm Surge Watches are in effect in purple above for parts of Louisiana and Mississippi. Along the coast, those Storm Surge Watches are in effect from the Mississippi-Alabama border westward to the mouth of the Mississippi River. Storm Surge Potential. A storm surge of up to 4 feet will be possible depending on the timing of the surge and tide cycle across parts of the northern Gulf Coast as Gordon approaches. Storm surge flooding occurs when rising waters move inland, causing normally dry areas to be flooded. Flood Potential Wednesday. Due to the potential of heavy rain from Gordon Wednesday across parts of Louisiana and Mississippi, the Weather Prediction Center has issued a Moderate Risk of excessive rainfall that could lead to flash flooding. Hourly rainfall amounts of up to 2” will be possible, and total amounts of 5-10” could fall along the path this system. Map: NOAA. Jebi On Satellite. Out in the western Pacific, Typhoon Jebi continues to approach southern Japan with the potential of damaging winds and heavy rain. Jebi continues to weaken, and as of Monday evening local time the system had estimated sustained winds of 110 mph (the equivalent of a Category 2 hurricane) and was moving to the north-northwest at 13 mph. 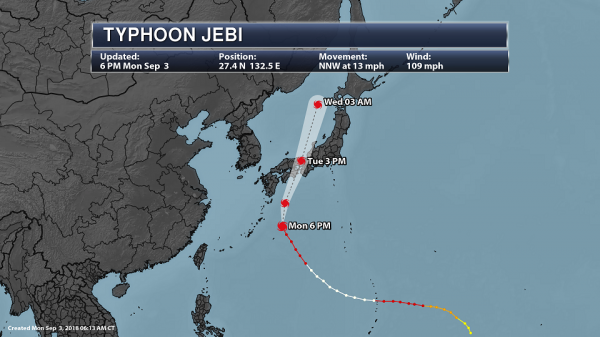 Jebi Forecast Track. Jebi will continue to move north to northeast over the next couple days and is expected to make landfall near Kobe on Tuesday as a typhoon. Even though some additional weakening prior to landfall is expected, Jebi is still expected to have sustained winds of 90 mph by Tuesday afternoon. 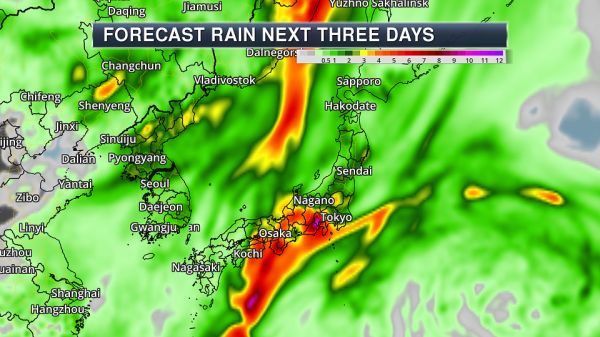 Damaging winds and heavy rainfall leading to flooding and mudslides are possible from Jebi in Japan – this includes Tokyo, though the greatest risk will be to the west and southwest. Map: AerisWeather. Forecast Rain Potential. There is still the potential that 6-12″+ of rain could fall along the path of Jebi over the next three days. This heavy rain will increase the potential for flooding and mudslides across the hardest hit areas. Midwest Rain Forecast. Additional rounds of heavy rain are likely over the next several days across parts of the upper Midwest, particularly from Kansas into Wisconsin, due to several systems moving through the region. 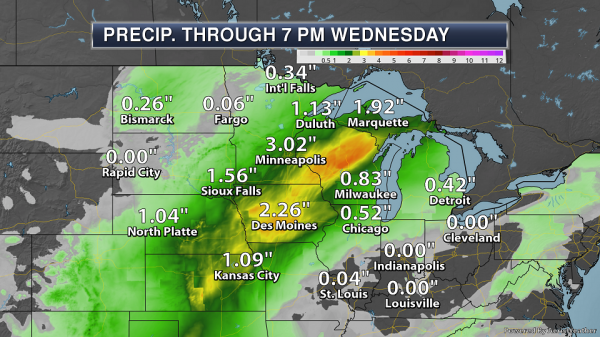 Rainfall totals from now through Wednesday evening of at least 2-4″ will be possible. Due to recent heavy rains, some flooding is already ongoing across the region, and any additional rain will make the situation worse. Map credit: Praedictix and AerisWeather. Excessive Rain Threat Tuesday. 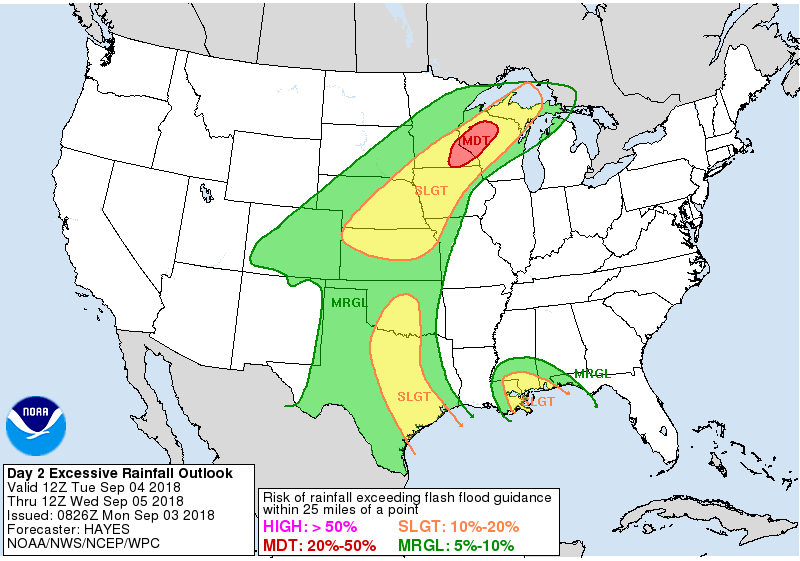 Due to the potential of heavy rain Tuesday and Tuesday Night across parts of the upper Midwest, the Weather Prediction Center has issued a Moderate Risk of excessive rainfall that could lead to flash flooding. That highest threat area is positioned from southwestern Minnesota into western Wisconsin. Flash Flood Watches. As of Monday morning, Flash Flood Watches were in effect from Kansas into northern Illinois. I would not be surprised if additional watches are issued across parts of Minnesota and Wisconsin over the next several days due to the heavy rain threat. September Heat Wave Continues for Much of America into mid-September. Looking out 2 weeks GFS guidance keeps a heat-pump high over the southwest and southcentral USA, with puffs of cooler air breaking up the hot, sticky monotony for the northern tier of the nation. Photo credit: “Your nose knows what’s on the way.” Lucy Chian/Unsplash, CC BY. One Top-10 List I’m Glad Minnesota Isn’t On. 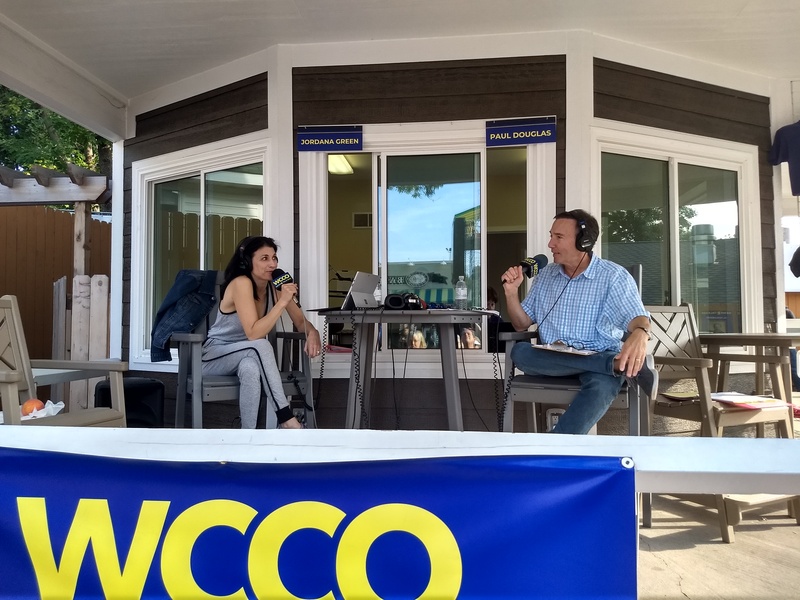 “They love us – they really do LOVE us!” I had to chuckle after reading a recent (glowing) review of the Minnesota State Fair by a New York Times reporter. As much as we enjoy being tucked away in a quiet corner of fly-over country, Minnesotans (myself included) tend to bristle at negative reviews of our fair state. Here’s one list I’m glad we’re not on: America’s 10 Most Disaster-Prone States. California is number 1, due to the frequency of quakes, floods and fires. Then comes Texas, Oklahoma, Washington State and Florida. Arizona came in 21st (fire risk) and Iowa 24th (frequent floods). We didn’t show up in the Top 25, in spite of our hearty winters, icy commutes and occasional tornadoes. Those cold fronts have a way of immunizing Minnesota from some of the worst weather on Earth. America’s 10 Most Disaster-Prone States. This is one list you don’t want to be on, and I’m happy to report that Minnesota is not on this list. US News has the report. Photo credit: “Starting at $69,500, the all-electric I-Pace runs from naught to 60 mph in 4.5 seconds, with 394 horsepower and 512 pound-feet of torque going to all four wheels. But that’s not what’s important here.” Jaguar. Photo credit: “Mary Amanuel, who does not use social media.” Photograph: Alecsandra Raluca Drăgoi for the Guardian. 76 F. high in the Twin Cities on Labor Day. 77 F. average high on September 3. 85 F. high on September 3, 2017. September 3, 1970. During the early evening hours, in the midst of a severe hailstorm at Coffeyville KS, a stone 17.5 inches in circumference and nearly two pounds in weight was recovered. It was the largest measured hailstone in U.S. weather records. 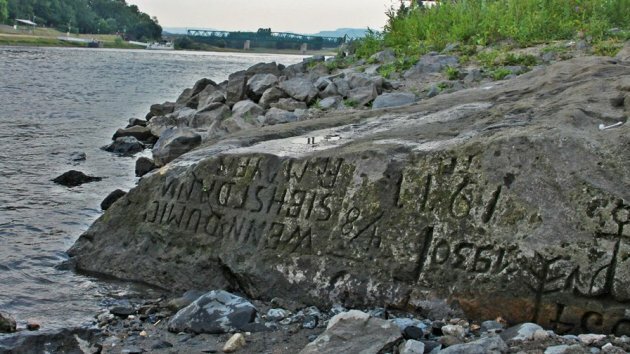 Average stone size from the storm was five inches in diameter, with another stone reportedly eight inches in diameter. September 3, 1821. A hurricane made landfall at Long Island, near Kennedy Airport, then moved through western Connecticut. The hurricane produced a record tide at New York City. September 4, 1992: Early morning storms result in 3/4 to 1 3/4 inch hail in Hennepin, Dakota, Rice and Goodhue Counties. September 4, 1941: A batch of tornadoes hits Minneapolis, New Brighton, and White Bear Lake, killing six people. September 4, 1925: The third consecutive day of 95 degrees or above occurs in the Minneapolis area. Photo credit: “A 747 Global Airtanker makes a drop in front of advancing flames from a wildfire Thursday, August 2nd, 2018, in Lakeport, California.” Kent Porter /The Press Democrat/AP. Video credit: “Greenhouse gases bubble from Arctic lakes.” NASA.